We love Autumn - all those lovely warm colours, the crisp cool air and the falling leaves on the ground. So to celebrate the start of the most colourful of seasons we are delighted to unveil our new Autumn flower collection, featuring a fabulous range of Autumn-inspired flower bouquets to brighten up your home, some of which are currently available with up to 34% off! Flowers are a great way to show how much you care for them. From a warm colourful bouquet like the scented Autumn Falls featuring gorgeous orange germini, santini and red berries, to the glorious Autumn Orchard Flowers filled with delicate pink germini and gorgeous yellow lilies, we've got any colour you could dream of. Add a box of Thorntons Chocolates or a Cuddly Toy with your flowers and you've got an ideal gift for your loved one this Autumn. 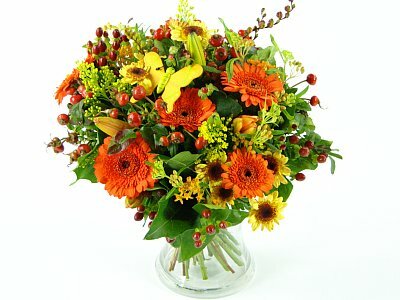 And remember – you can get your flowers delivered to ANY UK address, with free standard next-day delivery. 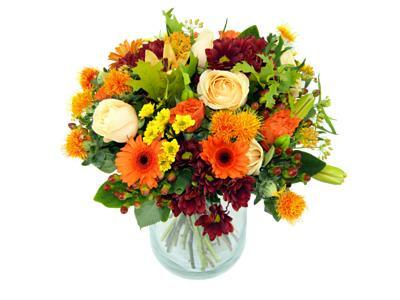 So why not brighten up the day of someone you love - by giving them a little bit of Autumn colour in their life. First of all I want to thank the author for sharing this post, I agree with that flowers are the only way to express your feeling to your loved ones. I prefer to purchase seasonal flowers mostly and I think this is the right time for that. Love to read such an informative article and to create an autumn atmosphere at home or in the workplace, one can splash it with different autumn flowers.